Greg and I went to the Columbus Zoo on Christmas Eve day. It was the least crowded I had ever seen the Zoo. Both for people and animals. There were no crowds and only about 40% of the animals were out and visible. It was still fun to get Greg out and give Miss Sally time to wrap presents. 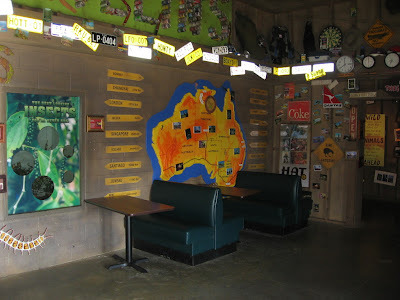 While we were at the zoo, we stopped in at Bob and Evelyn's Roadhouse in the Australia area. Bob and Evelyn's Roadhouse is the entry to the nocturnal animal building. 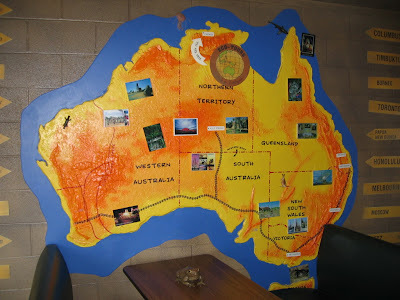 Inside, there is a huge relief map of Australia on the wall that I built with my own two hands. At the time, we were designing and constructing a large number of painted signs. Patrick, with Dragonfly Design, was using sign board for most of these signs. Signboard is a 4’x8’ sheet of treated plywood with a paper coating on one side. It’s a great surface for painting and can be made weatherproof. I decided it would be great for the Australia map. 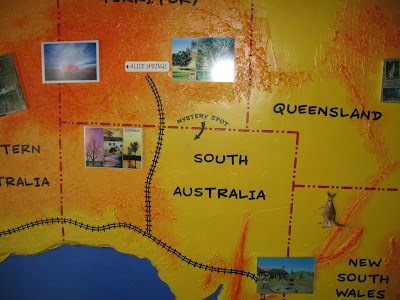 I hung two 4’x 8’ sheets of the signboard on a wall and projected an image of Australia on them. I traced. It’s tough to trace a line from a ladder and most of the eastern coast was free handed when my body eclipsed the overhead projector. I took the sheets off the wall and jigsawed the Australia from the scrap. I attached the two sheets to each other and got out a 1 gallon can of Bondo. Earlier I had asked Ray if I could use Bondo to make a relief map. Ray said, "Oh yeah. Bondo will stick to anything." For those of you who are not familiar with Bondo, it is normally used with car repair to fill in dents. It’s got a lot of other uses because it will stick to about anything. The plan was to lay down a coat of Bondo over the whole map to create texture and then apply more Bondo later to create the mountains. I chipped off all the Bondo (which actually did stick to some of the areas) and sanded the paper surface off the plywood. Re-applied Bondo. Let dry overnight. Go to Automotive store and buy more Bondo. Added mountains. More drying. Added bigger mountains. Sanded off the sharp points (points sharp enough to slice my hand several times.) Dragonfly Design painted the whole map and added borders, text and landmarks. We threw on some postcards and little plastic animals and hung the monstrosity in the nocturnal building. It is a thing of beauty. What I have not mentioned was Allen’s idea to hide magnets in the map. During the Bondo phase, I drilled out three holes, filled them with rare earth magnets and covered them in Bondo. Dragonfly added the text “Mystery Spot” with an arrow. As you can see, the magnets are strong enough to hold up my car keys. 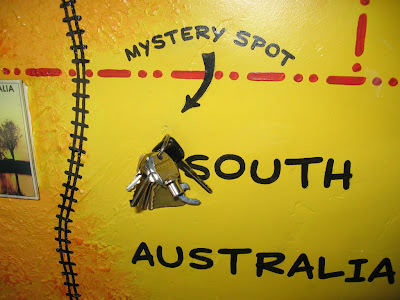 For the time that creating the map took and all the sweat and blood and tears, I still love the Mystery Spot the most. It is a beautiful map, but because there is a simple, little secret that only a few people know about and even fewer will find on their own is such a wonderful treat. 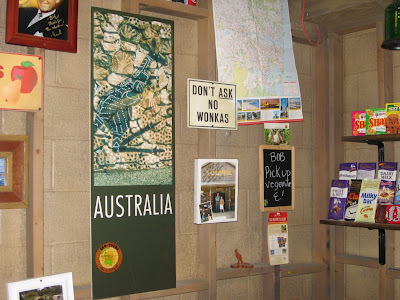 As a bonus, here is a photo of the DON'T ASK - NO WONKAS sign from a previous blog.